One sunny morning in July, on an otherwise unremarkable Wednesday, I slide into the driver’s seat of my car and head south. I pull onto the highway, a map of Texas in the passenger seat, like an ancient rune from a time before GPS, and I watch as the billboards turn unfamiliar and disappear. Big-box stores and strip malls turn to metal silos, oil refineries, and wheat fields. I wonder if such a small act of freedom will be unfathomable to future generations. You know, when robots have taken over and no one actually drives anymore, and we all just plug into the cloud of immersive reality or something. I wonder if stories like this one will sound as impossibly ancient as the pioneer wagons did to me when I was growing up in the ’80s, flipping through old-timey Westerns on the couch with a sleeve of Ritz crackers in my lap. Long ago, little girl, there was a thing called a road trip, and brave Americans took to the interstates in a machine filled with gas and good guesses—not because they had to, but because they could. My itinerary is three days, 1,000 miles. From Dallas, where I live, to the high desert of West Texas, tracing a backwards L-shape across the state. I’ve taken many road trips, but this one will be different. Usually my adventures are pointed Out There, to the coastal cities and the grand canyons beyond our borders. As a little girl, I considered Texas a temporary affliction, one I would inevitably shed, and I grew into a woman who studied the dots on the map where she hadn’t been with more reverence than the dots she had. Sometimes the only cure for this kind of self-loathing is to ship out and discover what you miss. I left Texas nearly 15 years ago, and I slunk back six years later. This road trip is part of a bigger mission—not to escape the place that shaped me, but to explore it. By myself? That’s right. But you’re a woman! Also true. I know some might consider what I am about to do unsafe, but I’d politely point out that whatever risks might exist make for a hearty education in self-reliance. Every human deserves to know they can make their own way—especially women, who are often told the opposite. I wonder if my long-held insistence that I can travel alone isn’t partly the influence of Texas, a place built on bravado and defiance. Tell me I can’t do something—then watch me do it, mister. MY ADVENTURE BEGINS heading south on US 67, eager as I am to avoid the slalom of misery known as Interstate-35. Taking US 67 out of Dallas and then heading south on US 281 has emerged as the softer, gentler path to move north and southbound through our state. I pass haystacks and pastures as I glide through towns like Midlothian, Alvarado, and Glen Rose, home to Dinosaur Valley State Park and fossils of the Acrocanthosaurus that once roamed these parts. Glen Rose is also where the late author John Graves lived and not too far from where he ended his canoe trip down the Brazos River, a solo expedition that formed his classic 1960 travelogue, Goodbye to a River. These days, canoeing sounds as outdated as dinosaurs, but Graves was a philosophic soul who believed the past lived inside the present. So I row my Honda down the auto-river, knowing that wherever I am headed, dinosaurs and native tribes and non-indigenous settlers and curious writers had helped to pave the path. Every human deserves to know they can make their own way—especially women, who are often told the opposite. I wonder if my long-held insistence that I can travel alone isn’t partly the influence of Texas. I stretch my legs in Hico, picking up US 281 about 100 miles from where I began. I hitch up my blue jeans as I climb out of the car and walk across the square in my wedge heels to the Billy the Kid Museum, where a white-haired woman named Sue fulfills all my fantasies about chatting with a friendly local, though it turns out she’s from Houston and moved to the country only in her retirement. The modest one-room museum is premised on a bit of speculative history: The Old West’s most famous outlaw was not shot and killed by Pat Garrett in 1881, but rather escaped and lived his final days in the area under the name “Brushy Bill” Roberts. Back home in Dallas, we’ve learned a few things about the power of a conspiracy theory and how far people will fall into the rabbit hole of alternative facts. Is the Billy the Kid Museum telling a true story? How would I know? We live in a time when people can’t agree on what happened yesterday. I doubt we’ll gain consensus on one dark night in 1881. But I know one thing; good stories are often better than true ones. I’ve driven through most of the 50 states, and I’ve never seen any of them foist themselves on their citizens like Texas. I wouldn’t blame anyone for hating us because of our oversized egos, and yet I can’t help feeling a bit sorry for the folks out there who will never purchase a potholder in the shape of their state, or pass a barn painted in the colors of the flag, or find themselves bound to strangers by this curious mix of kitsch and pride and overcompensation. By mid-afternoon, I enter the rippling asphalt of the Hill Country. I stop in Marble Falls at the Blue Bonnet Cafe, a diner where pies line a glass case like winning trophies. US 281 might well be nicknamed the Pie Corridor. Nearly every town boasts some fabled spot where sugar-spun concoctions are the specialty, and the Blue Bonnet is one of the most popular. I linger near the kitchen and admire a towering lemon meringue with its tawny foam top fighting gravity with all the panache of a 1960s homecoming queen and her Aqua Net. Indeed, there is something twinned about Texas hair and Texas pies. The flamboyance is over the top. But as the saying goes: The higher the meringue, the closer to God. Blue Bonnet is a far cry from the trendy coffee shops that have come to define the big-city experience, with their screeching espresso grinders, macaron selections, and young people tractor-beamed by the glow of a MacBook Air. I happen to love those places, but sitting in the Blue Bonnet, you might forget we live in an age defined by stress and technology. A family actually talks to each other at a nearby table. A couple shares forkfuls from the same gloppy slice. A man in a baseball cap pushes the remainders of a chicken-fried steak away from him. “I’m gonna burst,” he says, as the waitress smiles and refills his mug with the glass pot of coffee she carries around to each of us. The great Texas writer Larry McMurtry spent much of his career tracking the move of Texans from rural to urban spaces. He liked to puncture the romanticism that city slickers like me spy in the slow-syrup pour of country living. “Small towns don’t enlarge one’s character, they shrink it,” he wrote in his 1968 essay collection In a Narrow Grave. What I love about West Texas is the way it connects you to something beyond yourself. To the country you live beside. To the earth, the mountains, the stars. But more than a century into our great urban migration, small towns may have a counterargument. As the cities grow more crowded and polluted, marked by rising rents and ambient anxiety, small towns offer a peaceful path to a more sustainable modern life. The internet has made city living less critical than ever while crumbling old barriers of ignorance. All of us, wherever we roam, have access to the wider world. In fact, I post a picture of those pies on social media when I sit down, and by the time I get my check, the comments section is filled with heart-eyed emojis and jealousy from my friends who are walled up in their cubicles and high-rises. My destination tonight is Castroville, an Alsatian town about 30 miles west of San Antonio. If I once felt out of place in Texas, imagine what the settlers of Castroville felt like, trading the lush vineyards and mountain views of the French-Swiss-German border for the Middle of Nowhere, Texas, in the decades before climate control. I booked an 1850s-era cabin on Airbnb. Though rustic, it’s gotten a few upgrades over the years, including a chugging AC unit and indoor plumbing. My sleep is fitful, sweaty, and if I believed in ghosts, I’d place money a few are hanging around with me, though I can hardly blame them. What pioneer spirit wouldn’t be curious about the strange lady in the wedge heels with the iPhone? 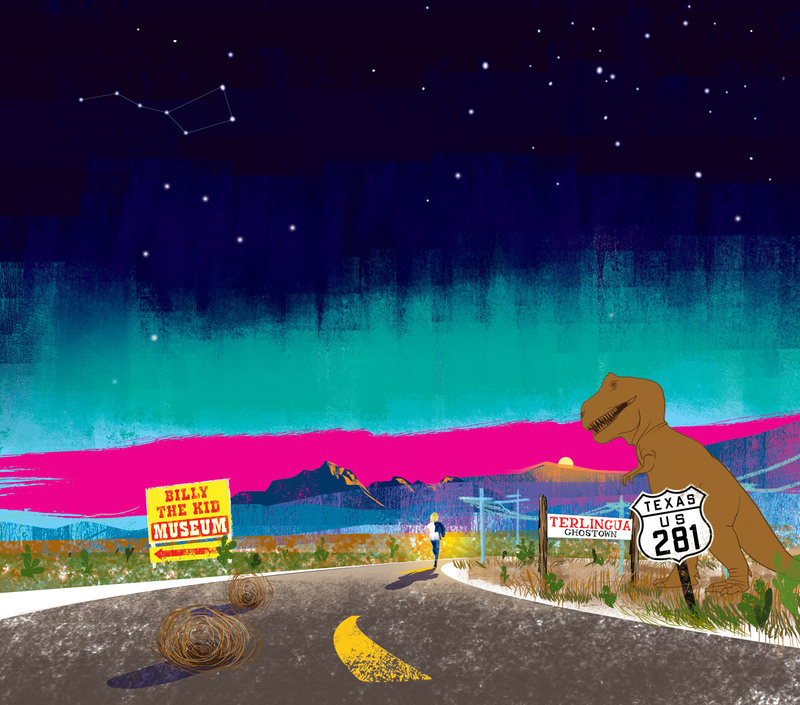 If John Graves was right, and the past lives on in the present, then maybe there is no such thing as a solo road trip. Maybe nobody ever really travels alone. ON THE SECOND DAY OF MY TRIP, I head west on US 90. Just that phrase—head west—has long filled me with the high fumes of possibility. Here, I let the moonscapes of the Chihuahuan Desert swallow me whole. I stop for coffee in Hondo (“Welcome, hunters,” reads a banner) and later in Uvalde, birthplace of Matthew McConaughey, where I pull up to one of those ice vending machines on the side of the road and am soon confounded by the simple contraption. I puzzle over the dollar slot and the metal chutes when two men in cowboy hats pull up in a giant truck. Ugh, just what this moment needs: witnesses. The men wait patiently for me to drop my independent-woman routine and ask for help, but I am nothing if not stubborn. Finally, I press a button—you know, the giant red button in the center—and a bag of ice flies down the chute. I wave to them as I depart, put a wiggle in my walk to regain a bit of dignity, and they wave in return. All yours, gentlemen. The next few hours are a kind of mental flatline—the meditative state I am always driving toward on a road trip, where I hurtle down the highway at a cool 80 mph, staying ahead of my own mind. I pass the blue-green waters of Amistad Reservoir and then Seminole Canyon, as pink and maroon cliff-sides rise and fall alongside me. I pull over at the Pecos River, known as the place where the Wild West begins. Trucks whizz past as I walk along the fence, hoping to find a better angle for my photo. I trade my wedge heels for flip-flops, but neither shoe was designed for what I do next, which is to hop up on a metal embankment and scramble up the fence for an unobscured view. Would previous generations of cowboys have found my action brave—or idiotic? Poor girl has the comfort of that cozy Honda, and she risks her life for glory on Instagram. I head toward Terlingua, a 19th-century quicksilver mining town turned ghost town turned enclave for artsy nomads who believe Austin isn’t keeping it nearly weird enough. I gas up in Marathon (pronounced Mara-thin) and head on to US 385 toward Big Bend National Park, the most solitary stretch of asphalt I’ve traveled thus far. I drive about 30 minutes without passing anyone when I notice I have no cell phone reception. About 15 miles later I start worrying I’m going the wrong way. My mind begins to unfold disaster scenarios: a blowout, a rattlesnake in the back seat. How long would I linger on the side of the road before someone found me? People who complain about a lack of privacy these days, well, come out to US 385, my friends. This is what it’s like to disappear. Soon enough, I arrive at the entryway of Big Bend, closed at this hour, but still welcoming to me, and pass a road sign that assures me I am about an hour and a half from Terlingua. Big Bend is one of the lesser visited national parks, which is a shame given its rugged beauty, but that also might be what saves the place in the end. I have fought selfie sticks in Zion and stood in hour-long lines at Yellowstone, but Big Bend is too remote, too brutal, too much of a fight to get there for the throngs of point-and-click day trippers. In Terlingua, I enjoy surprisingly good brisket at the Starlight Theatre and head to my shelter as the fading sun spills pink across the horizon. I’m staying at a place called Nuevo Terlingua, a serious upgrade from the previous night, with glossy cement floors and chic desert design. The piece de resistance is an outdoor bathtub hidden behind a stone wall. When it is good and dark, I pour liquid soap under the running water till the porcelain bath piles with foam, and I slip inside. A few hours up the road, McDonald Observatory is one of the best spots in the country for stargazing. I feel the cool breeze against my skin as I trace patterns in the sky: Orion’s Belt, the Big Dipper, the stories that once organized the world. The stars are so bright they pulsate, like pinholes punched into black velvet. In my many years of wandering, rarely have I enjoyed a moment this pure—nothing between me and eternity. I WAKE UP EARLY the next morning and watch a millipede slither across the floor as the Keurig brews my coffee. I slide a piece of paper underneath the little guy, and he rolls up into a ball as I place him on the front porch. By the time I lug my suitcase out an hour later, he’s on his way to somewhere else, just like me. I drive up State Highway 118 and west on US 90 to Marfa, the trendiest part of West Texas. I eat avocado toast at a spot where two would-be models talk about a killer party the night before. A British woman enters in a mesh body suit, and I struggle not to stare, though I suppose staring is the goal of that get-up. I enjoy Marfa, a quirky little town, but it’s starting to feel less like a part of Texas rediscovered and more like a section of Brooklyn relocated. Sometimes I want to interrupt the day-drinking and vintage shopping and ask: Do you people have jobs? I’m not complaining that Marfa is overrated; I’m complaining that the rest of West Texas is underrated. Take Alpine, for instance, a 25-mile drive east. I arrive to downtown Alpine shortly after dark. I park easily on the street and join a friend at a down-home bar, The Ritchey, where patrons unwind on the back patio with craft beers. We venture upstairs into a room that looks like a library, where we sit on velvet couches for nearly two hours without anyone bothering us. Heaven. We get to talking about highway travel. My friend asks if I’ve driven River Road. I confess I’ve never heard of it. “You can’t go home without driving River Road,” she insists, so I quickly shift my itinerary to accommodate one final trip that she will join me on. It is not lost on me that the most spectacular part of my journey is neither planned nor my idea. River Road refers to the part of FM 170 that stretches between Lajitas and Presidio along the Texas-Mexico border. It is a grand roller coaster that is so no-joke my stomach drops out twice as we crest a hill, a moment of perilous hangtime before my eyes find the road again. We pull into a scenic overlook and walk to the crumbling cliff’s edge and peer down to the Rio Grande, muddy and slow-moving in the heat of the afternoon. How much hope and grief and controversy had swirled in those waters, and how small it is up close. “Hi Mexico,” my friend says, waving to the mountains. “Hi Mexico,” I say, and wave, too. What I love about West Texas is the way it connects you to something beyond yourself. To the country you live beside. To the earth, the mountains, the stars. Probably what bothered me most about growing up in Texas was the idea that being here meant one thing about me—that I looked and sounded a certain way, voted a certain way, thought a certain way. But this state is totally unpredictable. There are just so many of us here. Back in the car, I crank Merle Haggard as we barrel down the highway together, singing along as our Topo Chicos rattle in the cup holders. As much as I have gained from solo travel, I think I prefer when someone else is along for the ride. It has been a long and lovely trip. There’s only one thing left to do—head home.